Counselling and group therapy programs are effective for treating drug and alcohol users. It produces a calm, yet alert feeling, reduces withdrawal symptoms, and decreases future cravings. Traditional Chinese Medicine (TCM) practitioners use techniques like acupuncture, herbal remedies, and massage to treat and prevent disease and illness in the human body. Acupuncture involves stimulating specific points on the body by inserting metal needles through the skin to restore balance in the body. A person’s life force, or qi, flows through the body and provides energy, blood flow, and a feeling of wellness. When that flow is disturbed or interrupted, it results in illness and/or disease. There are certain meridians, or pathways, along the body, each representing a different area of the body. Depending on the condition of the patient, a TCM practitioner may use herbal remedies in conjunction with acupuncture. Moxibustion is the practice of burning herbs near an acupuncture point. Massage techniques like rubbing, cupping, and pressing may also be used around specific acupuncture points. 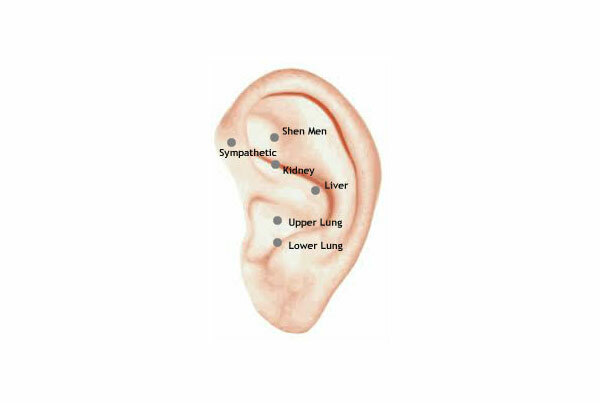 Auricular acupuncture is popular among practitioners who treat substance abuse patients. The practitioner positions thin needles on points in the ear while the patient relaxes for 20 to 30 minutes. The National Institute on Drug Abuse recommends ear placement in points that correspond with the traditional points of the kidneys, lungs, liver, and sympathetic nervous system. In a 1989 study, practitioners treated 80 severe alcoholics. They treated 40 people with auricular acupuncture combined with substance abuse counselling. They treated the other 40 people with only substance abuse counselling. Twenty-one of the 40 people who received acupuncture combined with counselling completed the program while only one of the 40 people receiving substance abuse counselling alone completed the program. Six months after study completion, the patients receiving both acupuncture and counselling were twice as likely to remain alcohol free. Located in New York City, the Lincoln Clinic has used acupuncture to treat drug and alcohol addicts for years. Practitioners there use acupuncture along with counselling, urine testing, and a 12-step group therapy program. Acupuncture helps relieve withdrawal symptoms and produces a calming, relaxing effect on patients, which helps fight drug and alcohol cravings. Patients of the Lincoln Clinic report that acupuncture treatment produces a strong calming effect while still feeling remarkably alert. The success of acupuncture treatment on substance abusers has spurred some courts to order acupuncture as part of a comprehensive drug rehabilitation program. As a result, the judicial system has found that substance abusers who receive acupuncture treatment along with counselling and vocational training are less likely to reappear in court on similar charges than substance abusers who are sentenced to prison. Acupuncture combined with substance abuse counselling and group therapy programs is effective for treating drug and alcohol users. It produces a calm, yet alert feeling, reduces withdrawal symptoms, and decreases future cravings. Article used with thanks to the Pacific College of Oriental Medicine.